The American 1950’s are often remembered through rose-colored glasses. But these were dangerous and tumultuous times. Mounting racial tensions, the Red Scare, and nuclear warfare, constant threats, lurked just below the surface. Day to day life had changed radically and rapidly with the advent of television, the interstate highway system, and the sprawl of suburbia. Under the flimsy facade of tidy innocence, instability and volatility had begun to boil over. Corruption and greed, ever present human qualities, had began to take the lead. John Blacksad, bicolor cat, Private Investigator, and protagonist of Blacksad, has his work cut out for him. 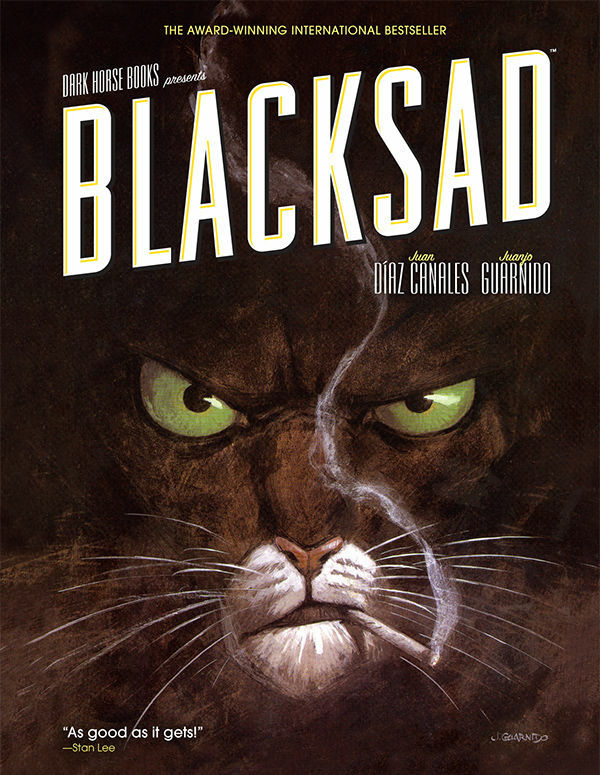 Spanish writer and artist team Juan Diaz Canales and Juanjo Guarnido have achieved a tour de force with Blacksad. Via expertly researched sophisticated story lines and delicately executed plot twists, Blacksad touches upon the more pressing and prevalent aspects of the social and political climate of America in the 1950‘s, many of which still resound today. Masterfully rendered in clean lines and meticulous watercolors (not surprisingly, Guarnido is a Disney veteran), Blacksad achieves a realism made even more astounding by its bestial cast of characters. Not so much anthropomorphized animal, more animalized human, each character perfectly conveys an essential spirit, but with a light and smart hand. You’ll not find anything as trite or juvenile as a pig cast as a police officer, for example, but you will detect an uncanny likeness to Lauren Bacall in she-cat Natalya, dame in distress/femme fatale. With expertly curated and apropos pop culture references, Canales and Guarnido have crafted Blacksad’s world with exceptional accuracy. The devil, as they say, is in the details, and they have, indeed, dug deep. Originally published in French, in album format, by Dargaud, Darkhorse’s English language edition is essentially Blacksad Volume One. Comprised of three stories, three cases that thrust characters and readers alike into the darkest of corners and deepest of underbellies, Blacksad is akin to a film noir-athon on paper, every bit as effective and evocative, but in 2D.